Seite für deutsche Touristen, die auf den Weg nach Florenz, Rom, Süditalien sich in Provinz Modena, im Panarotal, in Sassuolo, aufhalten moechten! Page for tourists, who, on the way to Florence, Rome, Southern Italy, would like to visit province Modena, Sassuolo and the valley of Panaro. 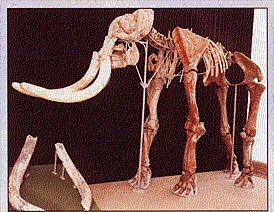 This is the mammuthus meridionalis kept at Savignano Civic Center. The Venus of Savignano.